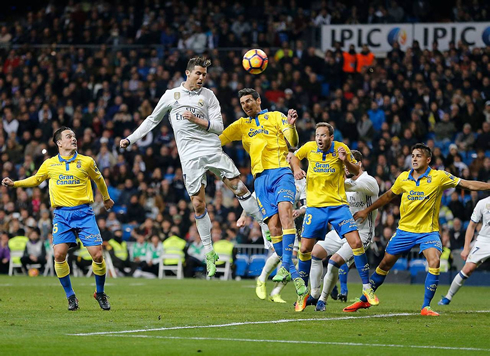 Real Madrid were held to a draw by Las Palmas tonight at the Bernabéu, in a game where Bale was sent off in the beginning of the second half and the Merengues were trailing by two inside the last 5 minutes of regular time. That was heart attack football. If Real Madrid keeps engaging in matches like this I'm not sure how much longer we'll be able to take it. Zinedine Zidane's men were thrown against the ropes tonight at the Bernabéu, but at the end, it was their preserverance that allowed them to still rescue what can turn out to be a vital point in this year's title race. 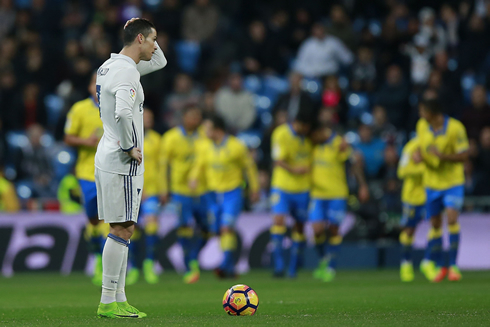 Real Madrid and Las Palmas tied at 3 this Wednesday, a scoreline that no one could have guessed! 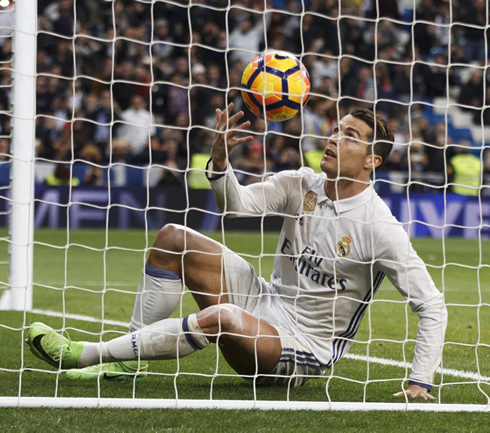 The home side cancelled the visitor's 2-goal lead with two goals from Cristiano Ronaldo in the 86th and 90th minute of the game. Still one game in had for Los Merengues, but Barça are now 1 point above on the top of the league table. 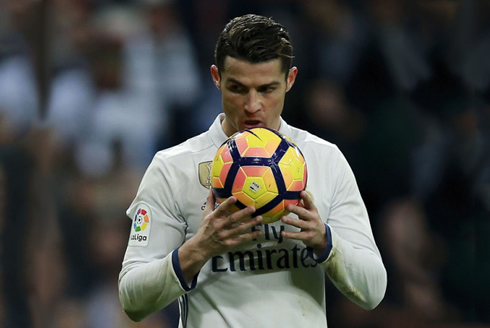 It was a stunning game of football at the Santiago Bernabéu, one of those rare occasions where every single emotion is experienced during a match, both on and off the field. Madrid would "escape" with a point after a 3-3 draw, but they will certainly rue the missed opportunities. It was a rollercoaster of a match! Barça had easily won earlier against Gijon by the tune of 6-1, so again, Madrid were in a situation with the pressure on. Las Palmas have been one of the freest flowing teams in the league this season and any La Liga fan knew that it would be a real test - however, few may have expected such an explosive game. From the get go, it was end to end stuff and the goals were plentiful. A tidy finish from Isco was followed by a rocket from Tana. It was 1-1 early and both teams showed their commitment to attacking football. Madrid's defense (as always), looked quite vulnerable this match and it showed later in the game. Despite some great attacking play from both sides however, the half would end without further goals. Enter the second half and all the fireworks we've come to expect from La Liga. Gareth Bale was sent off for two consecutive bookable offenses after lashing out. It seemed a bit out of character for the Welshman, but his sending off was likely deserved. However, for Madrid, it was a disaster. Las Palmas had already begun playing themselves into the game more and more and this came at the worse possible time. Soon after, Jonathan Viera would score a penalty after a Sergio Ramos handball and Kevin-Price Boateng would make it 3-1 as Madrid pushed everyone forward. But the remotada was on! Try as they may, Madrid couldn't seem to score despite the fact that there was so much time remaining. The players looked exhausted and Las Palmas seemed certain to score again. In the 86th, however, Madrid won a penalty after the ball was handled in the box and Ronaldo easily put it away. Then, a mere three minutes after, CR7 would score a massive header to give Madrid a point. It wasn't pretty and it certainly wasn't acceptable for a team aspiring to win the title, but Madrid will certainly take a point after such a wild night. However, this means that Barcelona now take over at the top of the league, though Madrid still have a game in hand. The defense honestly needs a lot of work - there is no cohesion back there and Madrid's inability to keep clean sheets will be their undoing unless it's rectified. Cristiano Ronaldo next game is a La Liga fixture, on March 4 of 2017 against Eibar. You can watch Juventus live stream, Eibar vs Real Madrid, Sevilla vs Athletic Bilbao, Manchester United vs Bournemouth, Liverpool vs Arsenal, and Leicester City vs Hull City, all matches provided from our football and soccer game pages.